Enveloped by lush tropical greenery and azure blue ocean, Bawah Reserve rests in sheltered carefree seclusion 300km northeast of Singapore in Indonesia’s remote Anambas Archipelago. Surrounded by clear turquoise waters, blue lagoons and coral reefs, this pristine and previously uninhabited marine conservation area cater to outdoor adventurers with an appetite for indulgence as well as paradise seekers looking for relaxation. Breakfast is enjoyed overlooking the sea – from a height that makes you feel privy to a landscape view unavailable to most – and affords the opportunity for both healthy and indulgent belly-filling. Prepare to spend a generous portion of your morning dining on the vast breakfast spread and A La Carte menu which incorporates continental style breads, pastries, eggs, meat and cereals, freshly pressed fruit juices and nut milks, array of teas and coffees, hot options including traditional Indonesian dishes and the obligatory array of fresh local fruits. Stars of the breakfast show, though, are the coconut chia pots and the smoothie bowl with their homemade coconut granola, which can be made gluten-free and vegan on request. For dinner, visit the Tree Tops restaurant facing out across the resort’s lagoon and 2 of its 6 surrounding islands, where hand-crafted cocktails are paired with an array of dishes to choose from, including a vegetarian menu. Take the opportunity to head to the Boat House restaurant situated on the beach. If you like the sand between your toes whilst looking out onto the sunset then this is going to be your number one restaurant. With a menu full of mouthwatering dishes with a beautiful selection of local fish dishes you will be spoilt for choice. chat with the head chef, if you catch him. He has some incredible views on the local produce, and makes an exquisite coconut panacotta without any added sugar! Don’t leave without having sampled the late afternoon cocktail hour – with a selection of cocktails to choose from including our favorite lychee martini. It’s is the perfect opportunity to chill at the grouper bar and take in the magnificent views of the sun setting over the beautiful coral reefs. Create your own schedule for enjoying the resort’s pilates and yoga classes which offer a huge variety of different styles and derivatives of practice, or why not get your heart rate up with one of their high intensity or TRX classes. This with a combination of a spa treatment or two and some meditation time you will feel like a new person. Accommodation is varied and ranges from beach villas to overwater bungalows all with ocean views. The panoramic vistas over the ocean from the resort are phenomenal, offering the sort of views that instigate humbling perspective and put you in a simultaneous state of awe at Mother Nature’s astonishing talent. As a guest at Bawah Reserve in Indonesia, you will be treated to nothing short of utter idyllic luxury. Each guest villa at Bawah is complete with its own private view overlooking the turquoise blue lagoon and with its copper accented interiors, contemporary teak and tropical wood furnishings, outdoor living area and moving glass doors which bring the outside in – it is the epitome of calm. Many accommodations are reached via golf buggies by jungle pathways and ocean views, it’s not unusual to meet other wildlife on route, which only adds to the resort’s charm and truly authentic harmony with nature. Respectively, bare feet are best and shoes seem almost silly only a few hours after arriving. They even offer free laundry service everyday so no need to worry about tackling that pile of washing when you get home! The resort maintains a local and personal feel where staff, almost inexplicably, know guests by name and room number, yet possesses an air of intrigue where there is always something new to discover, with a wealth of activities to fill your days with, if chilling on the beach or overlooking the infinity pool, cocktail in hand, isn’t your thing. Highly recommended activities include cooking classes with the head chef, art classes, paddle boarding, kayaking, diving or snorkeling in the most magnificent coral reefs with an array of sea life from clownfish to sea turtles, you may even spot a baby black tip shark. If you’re an early riser then why not book in a guided trek to one of their viewpoints to capture the beautiful sunrise. Even when the sun has set there’s still so much you can do from movies Under the Stars to star gazing at night. For particularly active guests, a group or private yoga or Pilates and meditation classes are an essential start to the day. Classes take place in the dedicated movement deck with unrivalled, expansive ocean views to find your flow. Ask for Lisa as your instructor when booking. The hotel even offers a complimentary treatment each day of your stay. Choose from a deep relaxation back massage, or a full body Himalayan salt body scrub or why not take the time to relax and unwind with their signature yoga facial, it’s the perfect luxury to end the day. When it comes time to leave the island, departure is bittersweet as you’ll board the seaplane back to Batam were you will then catch a private plane back to the mainland of Singapore. You’ll already be planning your next visit, knowing you’ll be back. The place has that kind of extraordinary, magical stickiness to it. Conservation and sustainability drive everything that takes place on the island, this stunning eco-friendly offshore escape not only is an island full of beauty it also has an eco-friendly approach with ocean-friendly sun cream, eco-friendly laundry detergent, and no plastic bottles, they even harvest, treat and store their rainwater. All of the island’s waste is recycled and food waste is composted, and crushed glass is used in the water filtering process. 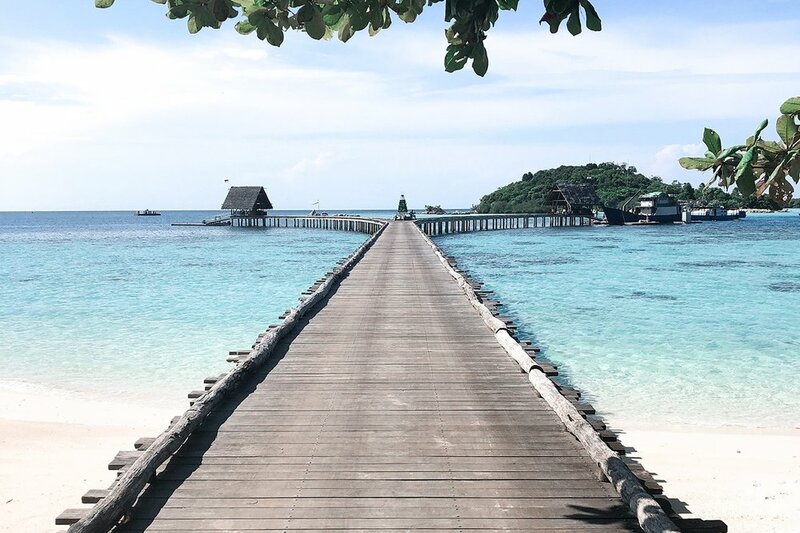 The Resort has even set up a Bawah Anambas Foundation which has been created to channel funds back into the land, the sea, and the local community.